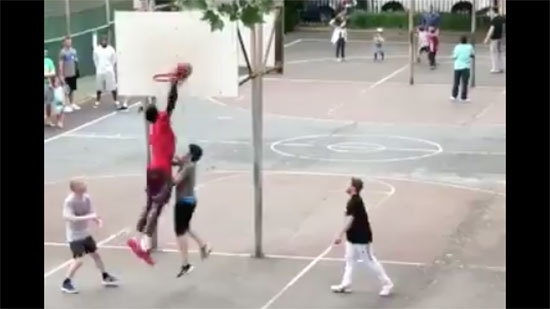 Philadelphia 76ers All-Star Joel Embiid has been caught schooling regular Joes in pickup games around Philly the past week or so. The 7-foot-2 Defenseman of the Year candidate has been stalking playgrounds in South Philly and putting in for "Next," clearly not content to sit at home watch the NBA playoffs. Of course, all the regular schmo's oblige and are complicit in getting posterized. But, when else would you get to play with one of the best? Even if he bounces the basketball off your head and then windmills it over you on the way to the slam. Watch some of the videos from different places shared on Twitter below. A 4-year-old boy was attacked by the family dog on Memorial Day afternoon in Philadelphia's Juniata Park neighborhood. It happened before 3 p.m. on the 4600 block of Shelbourne Street. Neighbors tried to get the dog off using sticks and a weedwacker. The child suffered bites to his body and neck. He was taken to St. Christopher's Hospital and is in stable condition. After the dog let go of the child, someone at the scene shot and killed the dog. Police did place one man in custody, no word on any charges. A gun was not recovered. Four people were stabbed, including the suspect, early Monday morning, 5/28, in Wilmington, DE. It happened just before 5 a.m. on the 800 block of W. 8th Street near Adams. Police found three victims, a 26-year-old man stabbed in the neck; a 49-year-old woman stabbed in the arm and torso; and a 24-year-old woman stabbed in the arm. The suspect had remained at the scene. The 52-year-old man had a laceration to his torso. The victims were taken to Christiana Hospital in stable condition. The suspect was taken to Wilmington Hospital and is in stable condition and remains in police custody. The circumstances surrounding the incident is under investigation.